Visit a sample site shown below to see how easy and intuitive it is for your online store visitors to place their order with a few clicks. 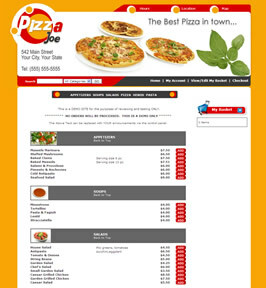 Note how customers are presented with your menu right up front, from the moment they arrive to your online store. They can view all your menu offerings without having to login or search to get there. Try the demo Online Store on the right to see how easy and intuitive the system is for your users. No matter how your particular business is set up; if you deliver or accept carry-out orders over the phone, you can improve your customer's service experience and free up your employees to take care of other things.